Every month on the first Tuesday. Each show car participant will receive FREE 2 large slices of pizza and a drink. Come to the DJ trailer to get your food ticket. Music provided by with DJ John Paul Gasca playing the hits from retro to right now. Open to all years, makes and models of cars, trucks and bikes. Rain date is the following Tuesday. Every month on the first Tuesday. Open to all European made classics, sports and exotic cars. Happy hour 4-7pm. Ace Cafe is THE place for all things cars, bikes and rock n' roll. With a full-service restaurant, art gallery and live music; there's something for everyone. Plus it is dog friendly. Every month on the last Tuesday except December. 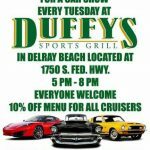 Hosted by the Florida Corvette Club, "The Most Active Club in the State". A great social club that offers socials and road trips each month as well as supports a number of charities each year. Open to all Corvette owners to come and mingle with the club members. Do not need to be a member to attend.